One of the first things we felt like God said about our little boy as we were praying for him was that his story would turn hearts to worship. That was why we chose his name: Judah Rise. Two years of believing God for a family landed us in this unique situation with a private adoption, and although it wasn’t what I’d ever imagined, it was the sweetest story I have ever lived inside of. A woman I had invested in through her healing from addiction wanted to give me a gift… and he had this unbelievable evangelism anointing, before he was even born. His story was the glory of God displayed in amounts of grace and mercy that I had never known. Losing him has washed me in an even deeper grace and mercy than that. Looking at the calendar that hangs on the wall behind my computer, I get a pit in my stomach at the realization that tomorrow is August 1. The month we were supposed to bring him home. Instead of excitement and joy, my arms are empty and my heart still aches. I have been angry, because we live in a broken world where sin results in death, and my soul cries out for justice for all that’s been stolen. I have been sad, because I laid down my life for months, holding nothing back, to fight for a life that God asked me to champion — and in an instant, he was lost. I have been confused, because I know what God promised for Judah’s life, and then it never even got to begin. Through the whole journey of fighting for Judah, I felt like God kept bringing me back to 2 Corinthians 5, where Paul writes about the ministry of reconciliation. I was challenged every time by verses 19 and 20, where it says that when Jesus died, he entrusted the message of reconciliation to us. We became ambassadors for Christ, God making his appeal through us. God. Making his appeal through us. The word “reconcile” is synonymous with the word “reconsecrate” — to consecrate again, to set apart or declare holy. To make something an object of honor. What Noland and I knew Judah was teaching us, as we gave our lives in hopes that we would get to hold him and tell him he was safe at last, is that we are a people committed to reconciliation. A people unshaken by darkness as we carry the banner of HOPE that God has entrusted to everyone who says they believe. So our hope banner for Judah looks like doing the very thing we knew his life would be a declaration of: PRAISE. He went straight to Heaven, and of that I am envious. I envy the fullness of his name that he understands right now, that I won’t know until I’m in the presence of Jesus with him. I envy my grandmother who passed away last week, who gets to be with my boy before I do. I envy the way that he feels no pain while my arms ache more & more every day to hold him. But we are banner carriers. A people who remember. A people who make alters from stones of remembrance even in our most painful places, because God is still good and He will still be praised. So on August 8, the day we were supposed to meet our boy, we’re going out and releasing balloons. 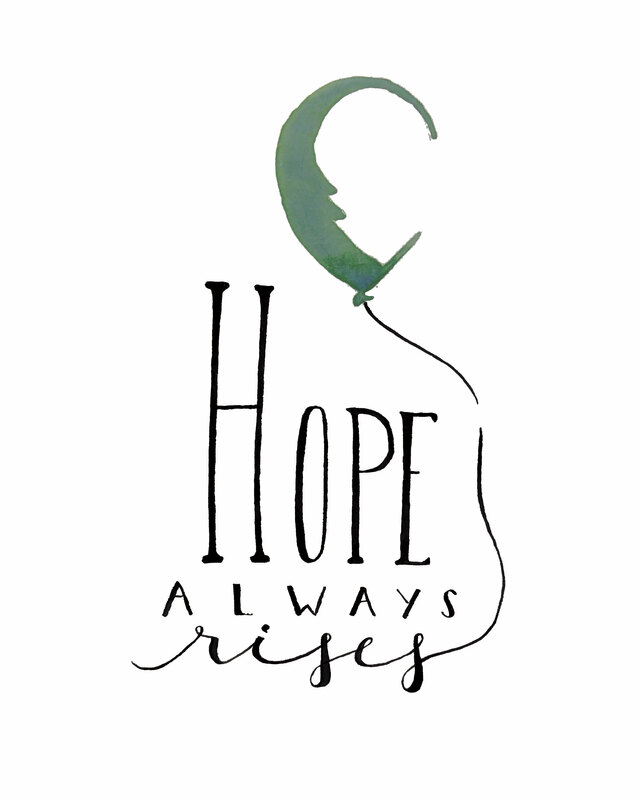 Balloons because hope always rises. We aren’t doing it because he needs it. I’m pretty sure he is doing just fine where he is on his birthday. But we are doing it because he deserves it. Because his life is worth celebrating and his story still carries weight in eternity, and we get to be the people who carry his legacy on this side of glory. We are doing it because we want to be a people who remember. We are doing it because we want our other kids one day to know that they have a brother in Heaven who was worth fighting for, and that the foundation he helped build our family on is worth honoring. We are doing it because we want to be a people who recognize and honor that God is worthy of our praise in our greatest victories and our deepest places of lack and loss. So when we raise our hands to release birthday balloons to Heaven for our boy next Saturday, we will also raise them in praise. Because none of it was in vain. God doesn’t waste our pain and grief has never stolen any of His glory. If you happen to participate, we would love to see your photos and hear some of your story. Use the hashtag #BalloonsForJudah so we can have all of our hope-cries in one place. To God be the glory! Your heart amazes and challenges me! Love your words and how you display so well who God is and His truth even in the loss and pain! I love who you are! We are grieving and praising with you! So proud of you guys! Thanks sister! Love you so much. Thanks Amanda. Such encouraging words! Love you so much and expanding in hope and trust just doing life near you. So inspired and proud of the way you’ve lived this story. Love you, sister! Thanks for living it with us. I have been reading your blog for some time now and I am so encouraged and blessed by your words and your faithfulness to our God. I just wanted to say that I am praying for you during this season and my heart goes out to you. Your story as well as your son’s story is one of hope and a tribute to the glory of God! Thank you for sharing. Oh my. I’m so so glad I clicked on your IG profile link–this post, your story, your words struck right to the depth of my waiting, wondering, abiding heart. Thank you! And yet, I’m so sorry that you’ve lived this story that you’re able to write about. I hate the brokenness of depravity, my own foremost. I hate the enemy’s attack against adoption. But I raise my banner with you in proclamation that our God is good, He is in control, and He loves us with an outrageous, unstoppable, unimaginable love. Praying you feel that, know that and PRAISE Him for that today. Thanks for these kind words! Always sweet to know other people traveling the same road. Believing for your breakthrough also!